One of the interesting markets in any industry is without a doubt Australia. It’s a country with huge population and very well developed economy. Other similar markets are the Western European market, the far Asia market and North America. The company starts operations in 2014 when the owners establish Luxbet Europe. The company has a license in the Isle of Man in the UK and Ireland. The owner of the bookie is Tabcorp Holdings Limited, which is one of the biggest and well-known companies in Australia and is in top 100 companies listed on ASX. Pretty typical and standard services offer the company. They have fixed odds as a primary number and percentage. The next big thing in the portfolio is the tote odds on racing. The services of the company are in use via phone and the internet. They don’t have physical addresses, so the only way to reach them is by visiting their website. The website of the company is very simple and full. Every client can find the exact information he/she needs right away. There are no especially complicated graphics which makes it easy to understand and to load fast. As a whole, the online bookie Luxbet is solid which explains the growing number of bettors and clients. Like many other companies, Luxbet does their best to offer as much betting options as possible. That includes more sports, of course. The online bookie accepts bets for over 50 sports. Some of these are soccer, basketball, cricket and over 50 more. The full and detailed list of all the games every gambler can bet on is on the table. There are also different races and winter sports which also are on the table. It is probably interesting to mention that aside the games no other options are available. There are no casino or blackjack games. This combination is very rare in the mobile gambling world. However, according to the management of the company nothing is for sure and these betting alternatives may soon find their places on the website. However, live betting is an option. The live betting button is in the header menu to the right. This is the place where all events which happen at the exact moment appear in a list. They are separated by types of sports and on each of them, the gambler can see the current result and the odds which are fixed. Also, the upcoming events in the current game are written. Live streaming of the games is not part of the services, but live statistics is. Therefore, each gambler can follow the event which takes place at the exact moment and makes better-informed decisions on when and where he/she can bet. Having fixed odds has significant advantages as they give bettors more security and comfort. However, sometimes fixed odds translate into lower wins, but this is part of the game. The bookie offers the most current odds like the handicap, head to head and comprehensive set over/under. It means that every bettor with some experience will be able to place bets easy and simple. On the other hand, the odds available for every event are on a list which is included on the page of the game. No one will be able to miss an option. Trying to become a name in an industry always means offering if not better, at least, the same level of service and quality of the products. What this means is it is not a surprise that Luxbet give their best to secure security and safety for all clients and gamblers. As a start, they have SSL encryption. That is a unique technology which allows every client to be more comfortable when submitting money to the website as hack attacks are less likely to happen. Also, all personal data is secured and the betting company guarantees they will not hand the information to third party organisations. Being relatively small the company decides not to make a multilanguage website. Instead, they stick to one language site as everyone in the world, nowadays, speak or, at least, understand English on a decent level. Another technology which they use is a creation of loop, and it is called PCI DSS or Payment Card Data Security Standards. 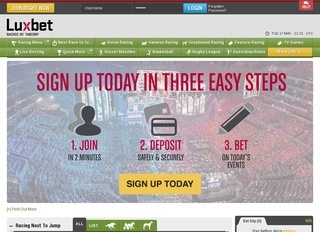 There are several different ways to contact the betting company. They have phone numbers for contact on the page, email, traditional mail and special form to fill. Live chat is also an option as well as social media where people from the company can be helpful for anyone. Deposit and withdraw options are not great. Only debit and credit cards can be used for this purpose. A full list of payment options including removes options can be seen on the table on the side. The currencies we stumble upon the similar situation. Luxbet decides not to offer any other currency and to allow players to bet on it. Only the US dollar is an option. However, that is not so bad as dollars are relatively easy to find, but they may become very expensive when US economy grows. One interesting bonus is the first deposit bonus which can go up to $500. This bonus is available when the gamer submits a deposit of up to $500. Minimum odds of 1.5 are allowed for this bonus offer. Another way to benefit is by betting on rugby. There is the special bonus of up to $200 if a deposit of $100 is placed.